The Emerging Civil War Series has covered many key battles in the Civil War, but now the series is tackling the most significant—and well-known—battle between the two American armies. 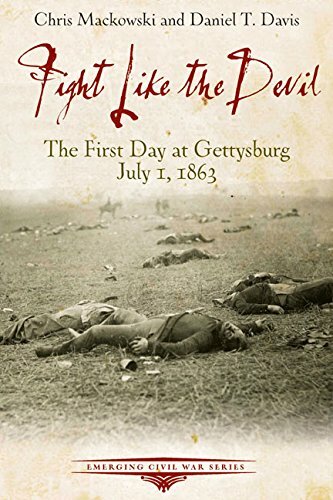 Fight Like the Devil: The First Day at Gettysburg, July 1, 1863 by Chris Mackowski, Daniel T. Davis, and Kristopher White, details the first day of the largest battle of the war in both a compelling and accurate manner. The battle of Gettysburg was fought from July 1-3, 1863 in southern Pennsylvania. Known as the bloodiest battle in the war—more than 51,000 men fell as casualties—Gettysburg provided a pivotal victory for Union forces following a heavy defeat at Chancellorsville, Virginia, just two months prior. With 12 books already in publication in the ECW series, White stated that the series waited to chronicle Gettysburg for reasons revolving around research and timing. The later days of the battle contain the blood, death, and victory Americans associate Gettysburg with, but that does not mean July 1, 1863, does not have compelling and vital information. The first day is also known for what White, Mackowski, and Davis all call “the most second-guessed decision of the war”: Confederate general Richard Ewell’s decision not to attack a Union position on Cemetery Hill. Arm-chair historians love to suggest that Ewell’s predecessor, the late “Stonewall” Jackson, would have attacked the hill, but the trio of historians say the evidence supports Ewell’s decision. Fight Like the Devil is the first in a four-part series of books by White, Davis, and Mackowski. Books two and three will cover the second day of the battle in a pair of volumes—one that focuses on the north end of the field and one that focuses on the south end. “The second day at Gettysburg is really a series of small battles, so breaking them up into two volumes will make it easier to explore them,” White says. The fourth book will cover the final day of the battle and the Confederate retreat back to Virginia. A companion volume to the series, The Last Road North: A Guide to the Gettysburg Campaign by Dan Welch, will look at the campaign as a whole. Last Road North is slated for release this fall, with the other Mackowski/White/Davis books to follow in 2016. This entry was posted in Books & Authors, Emerging Civil War Series and tagged Battle of Chancellorsville, Battle of Gettysburg, Cemetery Hill, Chris Mackowski, Daniel T. Davis, Fight Like the Devil, Kristopher D. White, Little Round Top, Oliver O. Howard, Pickett's Charge, Richard Ewell, Stonewall Jackson, The Last Road North: A Guide to the Gettysburg Campaign, The Wheatfield. Bookmark the permalink.